The dignitaries came to Portland Community College’s Sylvania Campus in groups of two: Two members of Congress. Two state-of-the-art fuel cells. And a member each of the U.S. Department of Energy and Hillsboro-based ClearEdge Power, the maker of the cutting-edge fuel cells. 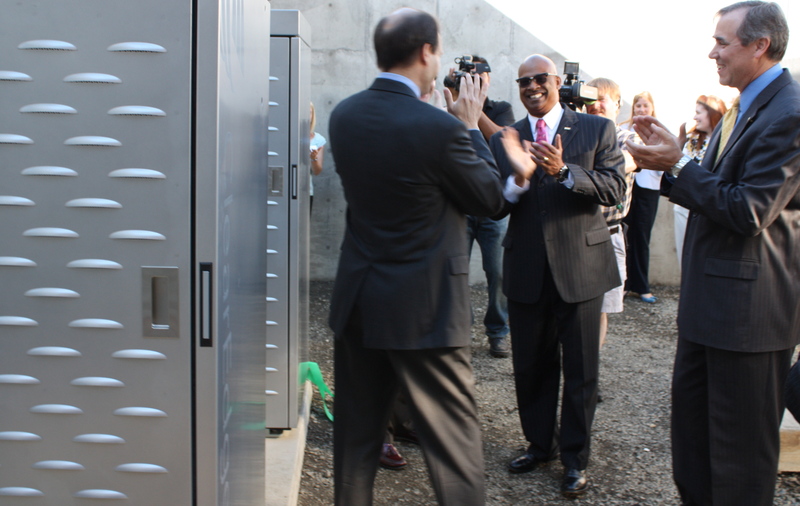 The Thursday, Sept. 29 press conference was the unveiling of the twin cells, which are providing power to Sylvania’s Health Technology Building and heat to that building’s swimming pool. The projected cost savings to the college is estimated at 3 percent of the total utility bill annually with a net 20-year savings of roughly $158,000. The total fuel cell project cost $162,037 and thanks to the Department of Energy contribution, PCC had to only pay $79,537 of that. PCC District President Preston Pulliams enjoys a moment with dignitaries at the ClearEdge fuel cell announcement on Thursday, Sept. 29. The participants in Thursday’s press conference applaud following the ribbon cutting. At left is one of the two now-operational fuel cells. Dignitaries on hand included U.S. Sen. Jeff Merkley and U.S. Rep. Kurt Schrader, whose congressional district includes Sylvania. 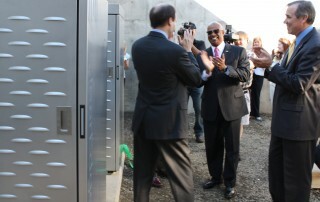 The fuel cells are all part of an effort to retrofit Sylvania, PCC’s oldest campus, to make it more sustainable. The fuel cells, called ClearEdge5, convert natural gas into electricity and heat. According to ClearEdge Power of Hillsboro, that makes the cells 10 times more productive than solar power and reduces a portion of the campuses carbon footprint. PCC is the first college or university to activate a ClearEdge fuel cell, although others are expected to come online this year. U.S. Rep. Kurt Schrader praises PCC for its pioneering green initiatives. 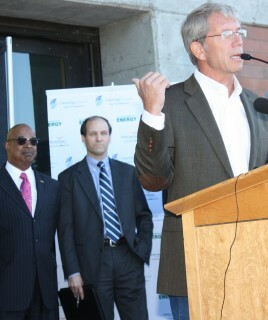 He said PCC’s many classroom programs in energy efficiency mean “jobs right away” for the program graduates. Other speakers at Thursday’s event included Russell Ford, president of ClearEdge Power, and Rick Farmer, deputy project manager and chief engineer for fuel cell technologies at the U.S. Department of Energy. Pulliams said the retrofit of Sylvania is just one aspect of the college’s sustainability goals. Since the passage of a $374 million bond measure in 2008 – the largest successful bond measure for an educational institution in state history – the college has opened the Willow Creek Center, which is rated as LEED Platinum status – LEED is the internationally recognized measurement for energy-efficient buildings – and the Newberg Center, which is LEED platinum now but could surpass that when all systems are fully online. Construction at all three main campuses and PCC’s Southeast Center also will focus on sustainability. Pacific Northwest National Laboratory will monitor PCC’s fuel cells during the next several years to confirm the energy-usage goals.